Just got back from spring break with my husband, Mark, and I am so excited to share some of the great street style I saw in L.A. – places like the Promenade in Santa Monica, the Grove in West Hollywood, and of course, Rodeo Drive in Beverly Hills. As I blogged after my last L.A. street style shoot, I am so inspired by creativity and free-spirited looks I see in that part of the country. And who doesn’t enjoy bright, sunny days to further illuminate a girl’s look? Although most of my street style shots are candid, I simply had to stop this woman briskly crossing Rodeo Drive to request her portrait. I’m reading everywhere this spring about slip dresses, that garment which I imagine looks hideous if improperly styled. 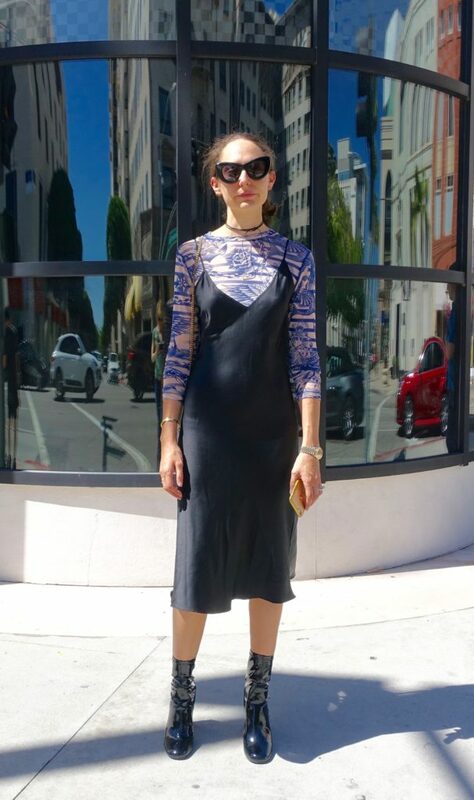 I am totally inspired by how this angeleno did it: a black slip dress over a filmy dancer-style top and ankle boots (perfectly fitted to the ankles). At first, I thought that her upper body was covered in tattoos until I looked more closely. I didn’t ask if the effect was intentional, but if so, brilliant! The shiny patent leather boots bring out the sheen of her dress for added elegance, don’t you think?